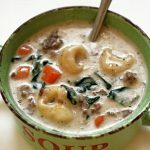 A creamy soup with ground beef, spinach, carrots and cheesy tortellini. Heat a pan on your stove over medium high heat. Add in the beef and onion. Brown the beef for about 5 minutes. If there is excess grease spoon it off or drain it with a colander. Add in the spices (garlic powder, Italian seasoning, salt and pepper) and stir them into the beef. Transfer the beef to the slow cooker. Add in the carrots, celery and broth. Stir a little. Cover the slow cooker and cook on low for 6 hours or on high for 3 hours. Turn slow cooker to high. Remove the lid. Add in your tortellini. Usually if the liquid is boiling it only takes 2 minutes for frozen tortellini to cook (for fresh it will take longer). Stir your cornstarch into your warmed half and half until it is smooth and creamy. Stir the mixture into the slow cooker. The cornstarch will help thicken the soup in a couple of minutes. Taste test and then add salt and pepper to taste. Ladle into bowls and serve. Get the Instant Pot Version here.